‘Tis the season to be merry, and that means putting up your best Christmas decorations and twinkle lights to make your home look a little more inviting for Santa and his reindeer. But climbing up on your roof to hang lights and mount other decorations can be quite dangerous — unless you can fly like Santa’s reindeer. One wrong move can cause you to lose your footing, which can lead to serious and even fatal injuries. You may not have to worry about slippery snow or ice on your roof in Phoenix, but you do have to beware of a number of other dangers lurking on your roof. If you aren’t careful, you could be looking at calling a roofer for some costly roof repair at a minimum or spending a few days in the hospital or worse. You might be used to wearing flip flops all year long thanks to the generally warm Phoenix weather, but they aren’t a good choice for working on your roof. Flip flops don’t provide any support, and your foot can easily slip, which can cause you to fall. Ditto for Uggs, which are another popular footwear choice in the winter. They may be called boots, but Uggs are more like boot-shaped slippers. They offer no support for your feet or ankles. Wear shoes that fit snugly and that offer plenty of ankle support. Hiking boots are a good choice as they are designed specifically for foot and ankle support. You’ll maintain sturdier footing even when you are on the steepest parts of your roof. Many accidents are ladder-related. The ladder can shift sideways or backwards, causing it to fall and taking you with it. You can also lose your balance while on the ladder, causing you to fall backward and taking the ladder with you. You must place the ladder on flat and sturdy ground. Be mindful of rocks, sticks or loose soil, which can all cause the ladder to shift. The ladder should also be placed at about a 75-degree angle to the house. Don’t worry — you don’t have to get out a compass to measure the angle. Just stand on the bottom rung and reach out your arms. When the ladder is at the right angle, your arms should touch the rungs in front of you while they are straight and you are standing straight. The ladder should also extend about three rungs or three feet above the edge of the roof. This gives you a better anchor for climbing onto and off the roof. Also make sure that the ladder doesn’t have any frost on it before you climb. This one should go without saying, but it’s surprising how many people need to be reminded. You can start to feel safe while you are on the roof and start to get cavalier — especially if you have a flat roof. However, you should always be careful. The average height of a fall that leads to fatal injuries is only eight feet, which is just the height of your ceilings. Walk slowly and take small steps. Keep an eye out for loose tiles or shingles. Even if you are walking carefully, you can lose your footing as soon as you put weight on one of these. A loose tile or shingle will act like a sled for your foot, taking you right off the roof. These roofing problems should be repaired immediately for the continued health and safety of your roof. Also keep an eye out for pooling water or patches of frost, which can also make you slip. Pay close attention to the condition of the roof as you walk. You should take signs of rot very seriously. Rotting underlayment can give way under your feet, and you can fall straight through the roof. Working with a Phoenix roofing company, ensures that you will catch these things early, but you should also keep a close watch while you are doing any work on your roof. Whether you are just hanging lights or you are trying to mount some extravagant blow-up figures or a life-sized Santa’s sleigh on your roof, you need to take precautions so that you don’t end up another casualty of a roof fall. Even if you aren’t injured, any mistakes can lead to some serious damage requiring costly roof repair. You can always call a Phoenix roofer for assistance with your decorations, ensuring that they are put up safely and without damage to your roof. 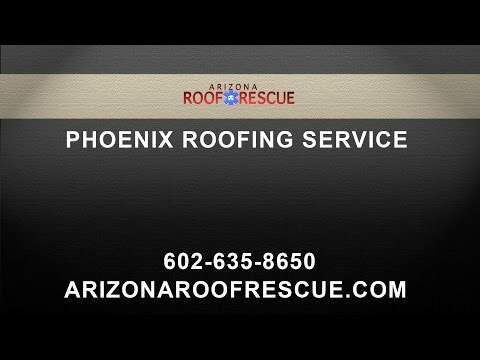 Arizona Roof Rescue offers ongoing roof maintenance to ensure your roof is strong and healthy, as well as emergency roof repair in case you have any accidents. Call us today to get the help you need.